About two and a half years ago I attended a Norwex party at a neighbors house. I had never heard of the company, but was just getting to know my neighbors and thought that a girls night out with wine, and within walking distance was a great thing. Turns out, I learned about a great company with amazing environmentally friendly cleaning products. What's not to like about that? Our line of cleaning products will save you time & money, improve health, and move towards creating a better environment. Norwex microfiber goes beyond "surface clean" with the innovative use of silver particles integrated into synthetic microfiber cloth. Cleaning with water only produces a healthy outcome for us and the environment. Cleaning with water only? And yet still removing bacteria from the surface? That's amazing! So at that party oh so many years ago, I bought one of the antibac microfiber cloths. And loved it. Maybe a little too much, and it's been very used. So this fall, while thinking about what I could get K for Christmas, I thought, why not invest in some more Norwex cloths. As I've mentioned before, I'm the queen of Lysol wipes. With Norwex cloths, I can still basically wipe the counter clean, but I'm not using the Lysol chemicals, since the silver that's integrated into the microfiber has bacteria killing properties. Perfect! After mulling over the catalogue, I decided to get the 4-pack of color coded cloths, a window cloth and a car cloth. Now I have 4 brand new Antibac cloths, in blue, green, yellow and pink and I will color code them for dusting, bathroom, kitchen and other. I can clean windows using a wet Antibac cloth and polishing with the window cloth, and we can do the same with the car cloth. Now time for the review! 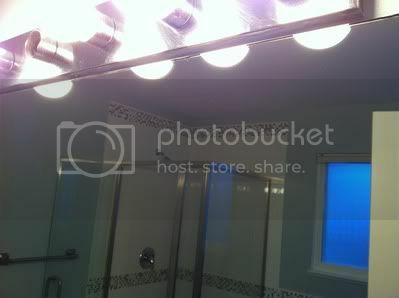 My bathroom mirrors have never been so clean! 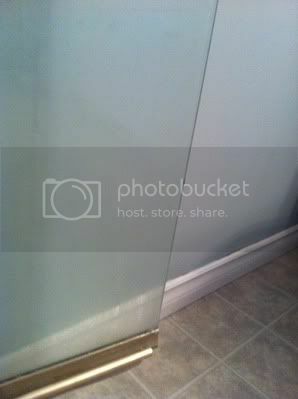 What better time to test out a window cloth than on a freshly renovated bathroom mirror with drywall and renovation dust all over it? 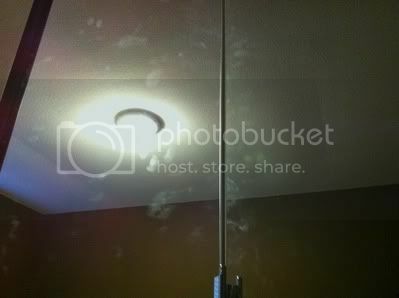 Oh and the mirrored closet doors with toddler fingerprints. When I first contacted my Independent Norwex Consultant, Julie, I was looking for an environmentally friendly way to clean my glass shower doors. I don't know if it was soap scum or water marks, but it bugged me every time I had a shower. She said that the Antibac cloth should clean it off and I was skeptical. But I tried it today, as part of the review and she was right. 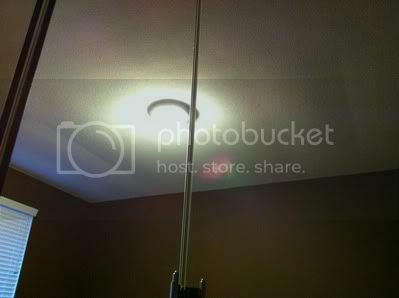 In the after picture, you can see that I only cleaned the far right side of the door. It took a little bit more elbow grease than the mirrors but it's definitely a LOT cleaner! On the mirrors, I simply took my bathroom cloth and got it damp, washed the mirrors and then took the window polishing cloth and dried them off. No streaks, no lines between the sections I did, not even any dust. And no chemicals, just water! Not bad! I'm glad I invested in these cloths. I hated cleaning with windex, especially since M loves to help clean the windows and I'm always so careful after to wash her hands, since I hate the idea of her touching those chemicals. Now, I don't have to worry at all. I also hate spraying windex since it goes everywhere and I'm paranoid about moving the toothbrushes. I don't think windex will polish our teeth. And since these cloths have the silver in them, I don't have to worry about the surfaces not really being clean. Norwex also offers a variety of other cleaning and personal products including skin care, baby care and more. It is all sold through independent consultants and the company is always looking for more people to join. It's a great way to make some extra money while helping people stay clean and environmentally conscious. And no, I'm not a consultant. Although I have considered it. For now, instead of selling these products, I'm going to give one away! I think that's much better! To win one Norwex Antibac Microfiber Cleaning Cloth, just fill out the form below! You must follow my blog, but there are ways to get additional entries, including following me on Facebook, and tweeting about the giveaway, which you can do daily. The giveaway will run until January 15th, so you have plenty of time to enter! This giveaway is open to blog followers in Canada and the US. Fill out the form below and earn additional entries by following me on Facebook, or tweeting about the giveaway, which you can do daily. Also head over to Julie's Facebook page and let her know I sent you! Make sure you spread the word, and good luck! Love natural cleaners, I've been using them for years. Would love to be able to use this to clean my sink and around it. It always gets gross! I've been hearing such great things about Norwex. Having wee ones in the house makes you think twice about all the senseless chemicals we use. 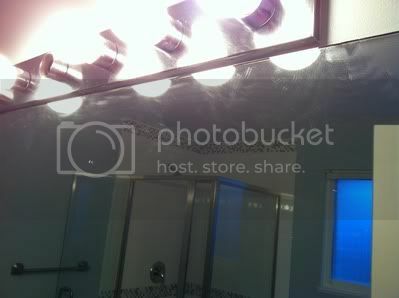 I would love to try this out on my bathroom mirrors. Seems like they need cleaning all. the. time. I would definitely love to try these out on my shower! I can never get it as clean as I would like. Love the Norwex products. They are nice to clean with. Me me me!!! My kids love helping with clean up!! Love the idea of this product! I have a few mirrors that could definitely use this!!! Since my new year resolution is to get our home organized, this would definitely help. With 3 little ones I'm always looking for chemical free too. I would clean my kitchen cabinests, sink and stove. I'd love to clean kitchen counter tops with it! I'd clean my bathroom mirror and then my windshield since it never seems to be super clear. 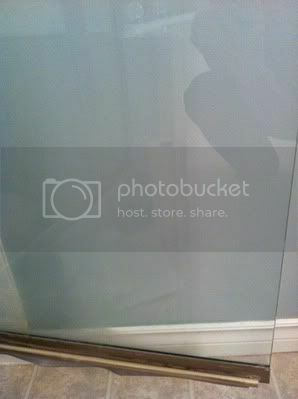 i would clean my bathtub, and the huge mirror in the hallway! I would love to try it on our shower doors, too! A question, though. How do you clean the cloths? Do they have to be washed separately so they don't get additional lint on them? And dried without fabric softeners, right? Susan, You're correct. Although, some have washed the cloths with sheets since they don't shed lint very much. And fabric softeners will coat the microfibers, making it so they won't have the same ability to pick things up. If you still want static-free products, Norwex does have dryer balls that work amazing-- without the chemicals. I am a new consultant, and I don't have many of the products yet, so I was looking for something to share at some parties coming up. Yours takes the cake!!! Do you mind if I share your page at my parties? Thanks!